On April 1-3 the 68th Chilean National Rodeo Championship took place in the city of Rancagua, best known as the “Champion de Rancagua.” I was invited by the Chilean Rodeo Federation to draw the event during the three days. They gave me a press credential, so I had full access to the different competitions and behind the scenes areas (like the stables). The national TV station was there and found it interesting that I was there sketching, so they recorded this video for the evening news. The Chilean rodeo differs from the one in North America although the origins should be the same: surround and herd the cattle. In the Chilean rodeo a couple of horsemen, called collera, mounted on purebred Chilean horses show their skills and courage to ride their horses. 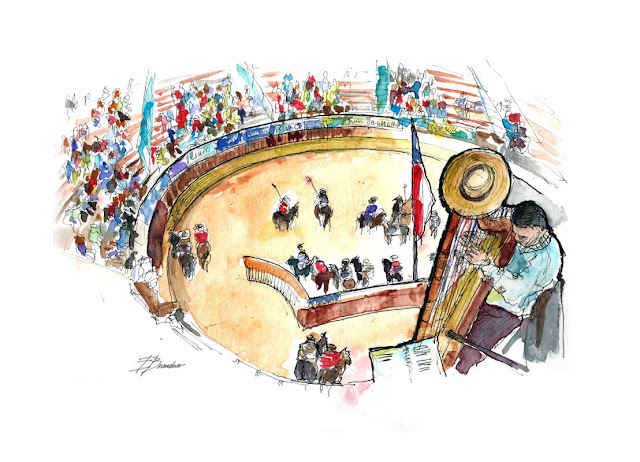 Riders must lead a bull or cow through the arena (which is known as a medialuna or half-moon) and try to tackle (stop) the bullock in specific areas. It was recognized as a sport in the 1960's, with standards and precise specifications of its competitors and rules. During the competitions, musicians play and sing cueca, tonadas and other traditional Chilean music. 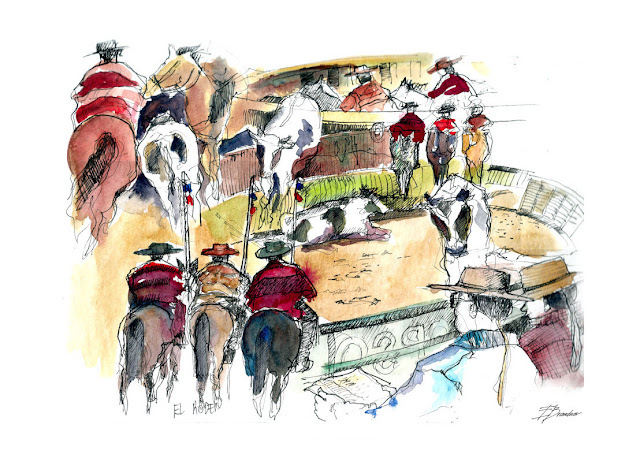 The highest authority of the rodeo is the delegate. In any rodeo there is a foreman who is a highly trained broker and whose responsibilities are to maintain order within the competition. The jury is formed with a short list that gives points and ensures compliance with the regulation and its rulings cannot be appealed. 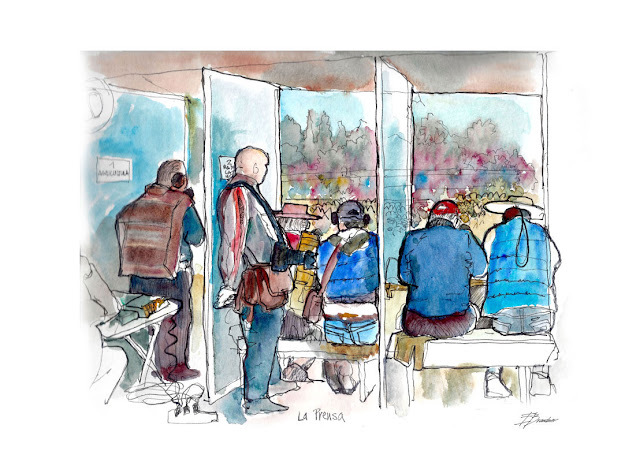 The rodeo spectators are very knowledgeable about this sport and follow closely the competition. As the tournament progresses the decibel level rises exponentially. The final is deafening. 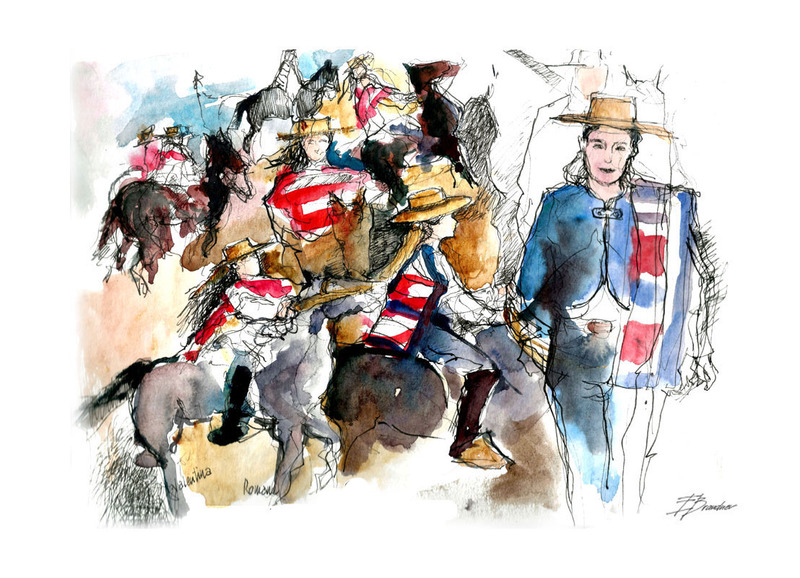 Rodeo has always been an essentially masculine world, but women have participated since 2005, first in the Rein Movement tourney. It consists of five or eight tests where the rider and horse must demonstrate skills such as running, trotting, galloping, presentation, and more. 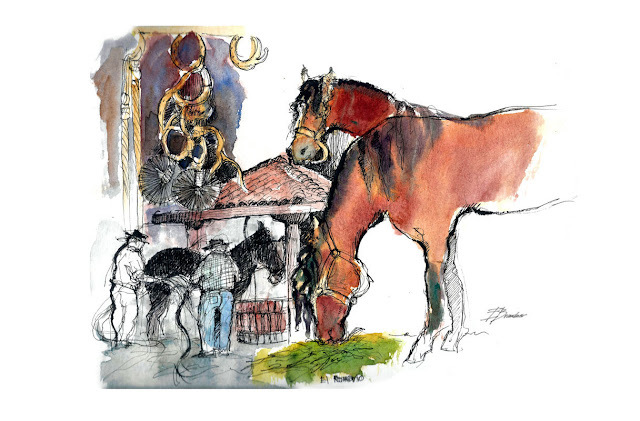 Within days of rodeo there is an exhibition of the best exemplars of “Chilean Horses.” They give an award too. Several horses stand there wearing a tricolour ribbon in red, blue, and white, the colors of the Chilean flag. 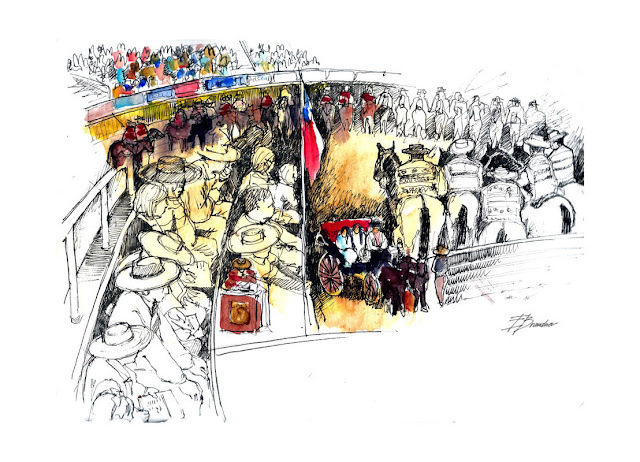 Both the Association of Breeders and the Rodeo Federation representatives were there. And each horse owner spoke about the characteristics of his exemplar. But I wonder... How does a Chilean horse look? I imagine something like a sheep's head, inherited from its Spanish ancestry. Plentiful, thick and wavy manes, and the horse should also be short. I could draw a famous horse: “Romario.” I was amused because this particular horse had a great topknot that looked like an abundant and wavy fringe. 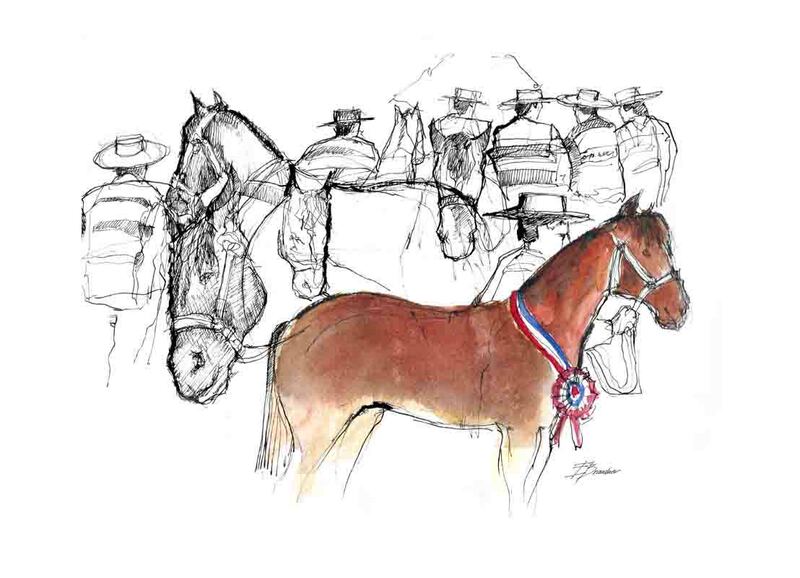 On the last day of the rodeo this same example was chosen for the "seal of the race" award: the most perfect Chilean horse or, as it says on the website of the Federation of Rodeo, the horse that has a stamp that demonstrates his "greatest breed purity." Rodeo is as old as our history and a lot of people live from this activity. 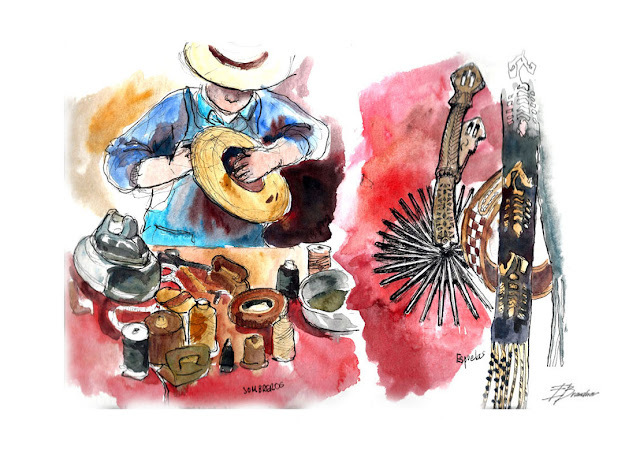 For example our artisans: it is associated with various forms of rural Chilean culture. It has an indispensable craft production for competition and for the huaso (Chilean cowboy) costume. Our huaso uses a hat that is called a “chupalla.” iron spurs, mantas and chamantos (a kind of poncho). Special shoes and leather leggings. There were also crafts for the horse, like stirrups (look so beautiful, made of wood carved with motifs of flowers, rosettes, buttons, ties and soles). Thanks to rodeo these artisans can continue having customers for their handicraft. 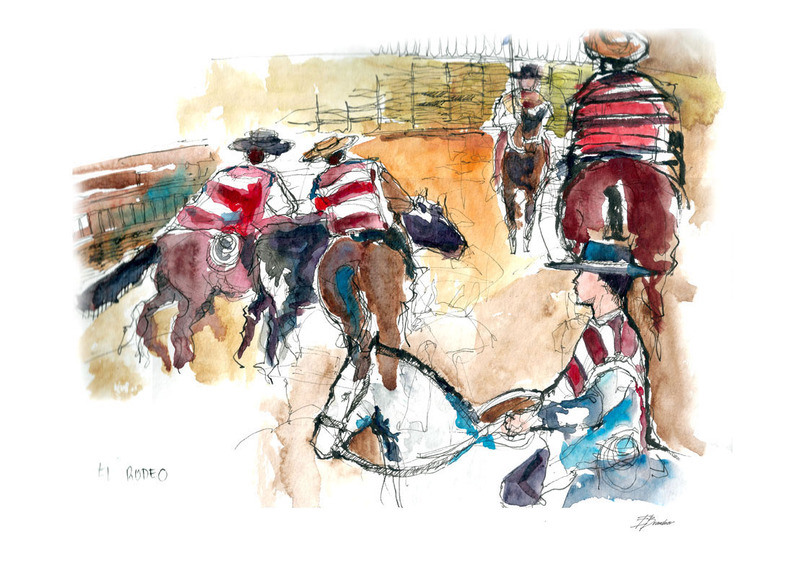 The official rodeo season takes place between the months of August and April each year with more than 350 competitions throughout the country. But now there are small championships starting in April. The cycle ends with the Champion of Rancagua. After football, rodeo has become one of the most popular sports in the country, both for its massiveness and its symbolic charge that has been acquired throughout the nation's history. I was surprised to look and draw the working specialised press. 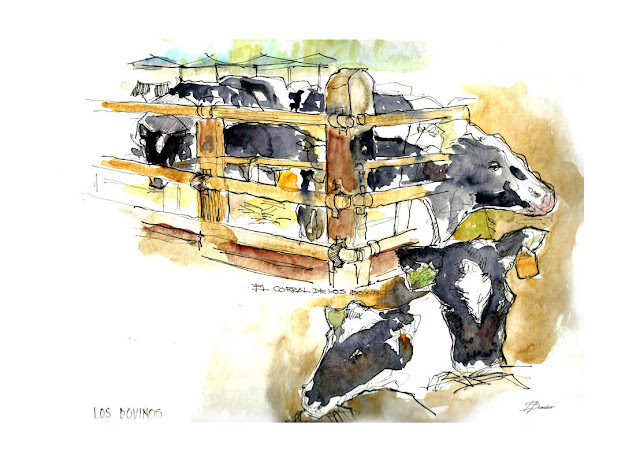 In my sketching walk through the stables I look for the cows. They eat and eat. In the rodeo they are not killed but some animal defenders groups protest against it indicating that it is an animal abuse. I watch them and hope that the vets who work there take care of the cattle too. Traveling through the stables is like visiting a busy metropolis. There are trainers to prepare and the horses and groomers, not serving people, but their horses. Their work is quiet, but very important, they are far from the lights and the cheering of the crowds. These people are responsible for arranging everything so that the riders look, and when we talk about everything, really everything; they clean the boots, reins, tools, etc., they feed, clean and saddle the horses. 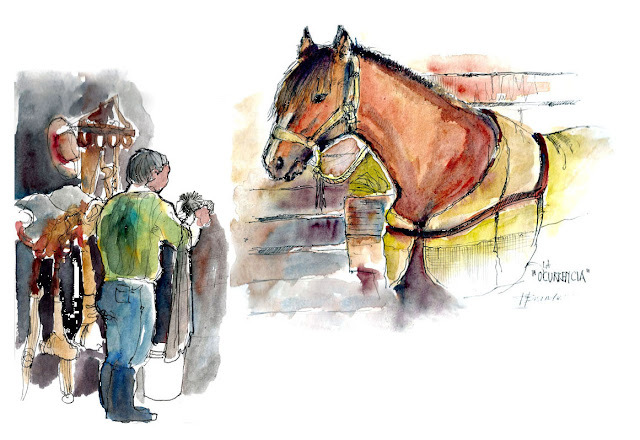 Trust and love with the horse becomes strong, as the petisero (groomer) is, ultimately, the link between horse and rider and who deeply knows the animal and gives support to the veterinary. But while there's a lot of work in the stables, there's a lot to eat too. Boiling kettles and grills provide food the whole day. Dishes of all kinds, teas, coffees and melons adorn the improvised tables. 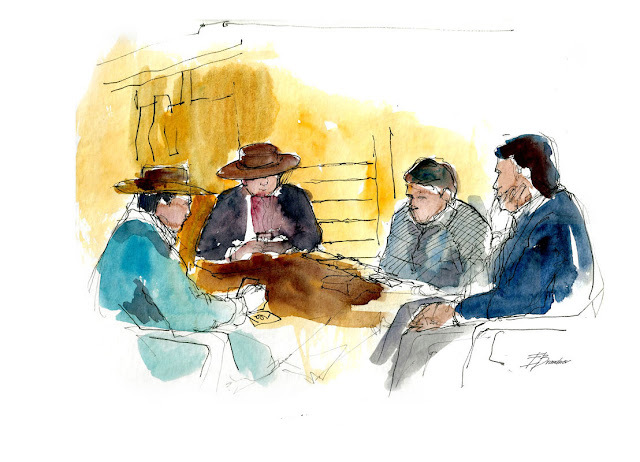 There's a small city where patrons and workers, after reviewing the daily tasks to ensure that the horses had received all the attention required, chat pleasantly and with humor while playing cards. They will sleep right there in tiny rooms in wooden cabins, very close to the stables. They do not care or even notice the cool temperature. There will be long hours where the conversation will illuminate the short night and the little sleep during two nights. Erika Brandner is graphic designer and illustrator based in Santiago de Chile. She is one of the administrators of Urban Sketchers Chile. You can see more of Erika's sketches here and here.